I leave work tired, hungry and in need of two things from the store. Guess which one I remembered? I must say I was a bit disappointed with the selection at my local liquor store. I ended up with a bottle of Corbières, which was satisfying, but I just had something else in mind. Also, one of my personal hippie-ish tendencies (along with CSAs, recycling grocery bags, etc) is supporting the Vignerons Indépendants de France. My store carried no wines in the independent syndicate. Thankfully there's a store with a nice selection of independent wines a Metro stop away. I got the tampons 2 days later. It reached the point of desperation before I remembered. On Saturday night there was a fireworks display at the Kennedy Center to celebrate the start of the Festival of China. Unfortunately this wasn't well publicized, so people all over the area just heard the noise and thought "Armageddon!". Maybe it wasn't that dramatic, but bangs were different from normal firework noises and also it wasn't the fourth of July. I was a bit unnerved and checked the weather to confirm that we weren't expecting thunder. Then I checked the news which said nothing about it - it was 10, so there was only Fox to rely on. I was about to head out, so F came up and we went to the roof where about a half dozen people had gathered. Some of them had been there long enough to have seen the fireworks and assuage everyone’s fears. One of them claimed it was in honor of Finnish Independence Day. Except that it wasn’t. It’s really quite irresponsible to go around maligning innocent Scandinavian countries. For those who were wondering (and that would be no one, since I’m the only one reading this), Finnish Independence Day is the 6th of December. Its declaration of independence was adopted in 1917. Previously Finland was a Grand Duchy of Russia, but after the revolutions they declared themselves independent. In the DC area, you can head to Memories of Finland in College Park to get all you need to prepare for the big day. 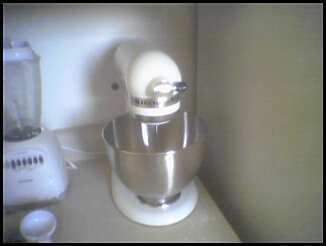 I've managed to bust out my KitchenAid once so far. It's lovely and gleaming and white, which may in fact be quoting Edelweiss. I made oatmeal cookies with almonds and dried cranberries. They were quite good. Unfortunately the almonds were indiscernible with the texture of the oatmeal. Still, they were yummy. Thankfully with the cameraphone image, you can't tell that my blender is dirty. Yay bad quality photos!